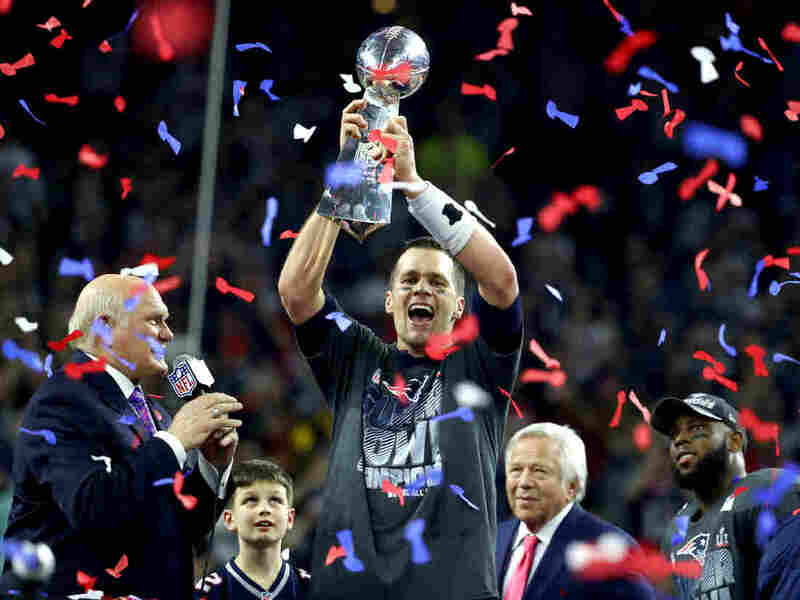 Patriots' Success Encourages Larger-Than-Life Expectations The Patriots' well-established reputation for winning has taught kids to dream big and believe that anything is possible. But is it possible to have too much of a good thing? Tom Brady celebrates after the New England Patriots defeat the Atlanta Falcons 34-28 during Super Bowl LI on Feb. 5, 2017, in Houston. 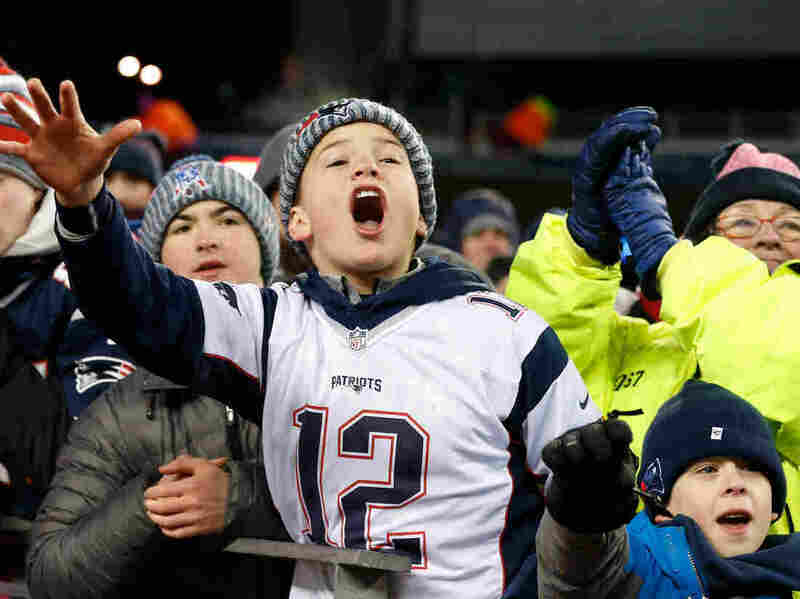 For all those impressed by the team's unprecedented success, there is perhaps none more mesmerized than their youngest fans, who swagger to school in Patriots' sweatshirts hoping to emulate their winning ways. The team's successes have offered great life lessons for countless kids in Patriots nation, but at the risk of sounding like a New England humble brag, it's starting to feel like so much winning may be sending the wrong message to some young fans. The idea of beating the odds, and exceeding expectations has become as much a part of the Patriots brand, as winning, and delivering excellence. As Pats' wide receiver Julian Edelman famously shouted at his teammates when they were almost hopelessly behind in last year's Superbowl, "You've got to believe boys. You gotta believe!" Young fans cheer after the New England Patriots defeat the Tennessee Titans at Gillette Stadium on Jan. 13, 2018, in Foxborough, Mass..
Today, T-shirts bearing that slogan are fan favorites, as are those boasting images of the dire 28-3 scoreboard before the Patriots staggering comeback, (by far, the largest ever in a Super Bowl.) It all reinforces the lore that began with the once-scrawny quarterback who was drafted 199th out of 200, and rose to become arguably the greatest NFL quarterback ever. Indeed, the team is full of guys once counted out, including Edelman, who was also drafted in the last-round, as he writes in his memoir, Relentless. His book recounts what he calls a lifetime of "ignoring the doubters," from clawing his way up from a 4'10", 95-pound freshman to become a star high school quarterback, and growing from a New England rookie in a position he'd never played before, to become the clutch player who'd make that epic Super Bowl LI catch that propelled the Pats to their stunning win. Edelman recently rewrote his story into a children's picture book called Flying High starring "Jules the squirrel." He says he wants to bring his lessons of resilience and determination to kids, and inspire them like he was growing up. "I always say, no dream is too big," he says. "Nothing's easy, it's a grind. You're gonna have to have a relentless mindset, and you really gotta believe." As a kid, Edelman says, he would make up stories and cast himself as the hero. "Sometimes it's hard to get up," he says, "so you play with your mind and that's [still] what I do." 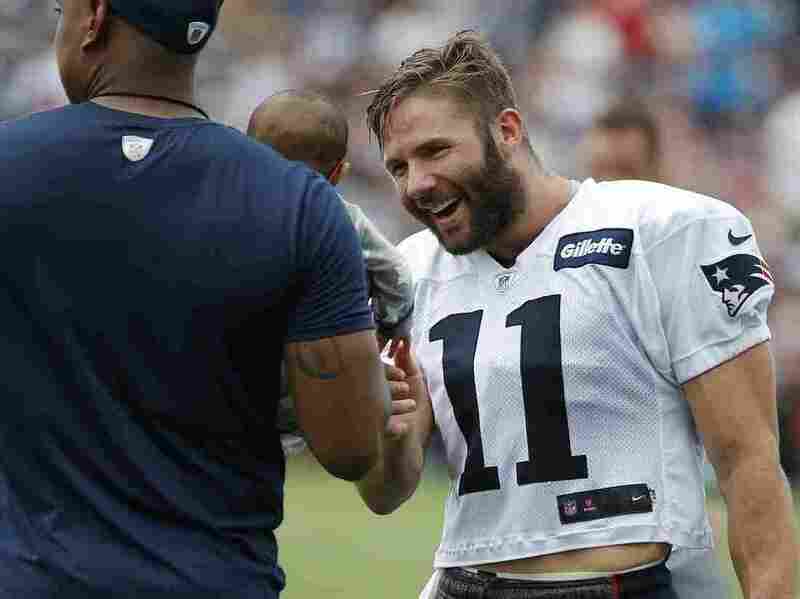 Patriots wide receiver Julian Edelman, who recently turned his personal story into a children's book, interacts with a baby following NFL football training camp in July 2017 in Massachusetts. Edelman says going from last year's Superbowl high to being sidelined this year with an injury, is just the latest in a string of adversity and obstacles he's had to overcome. "You can use it as fuel," he says, like any other challenge. "You know what you need to put into it, and ignore the word 'no.' You worry about what you can control... and constantly try to improve... Nothing is given to you, everything is earned." The message seems have gotten through to kids. 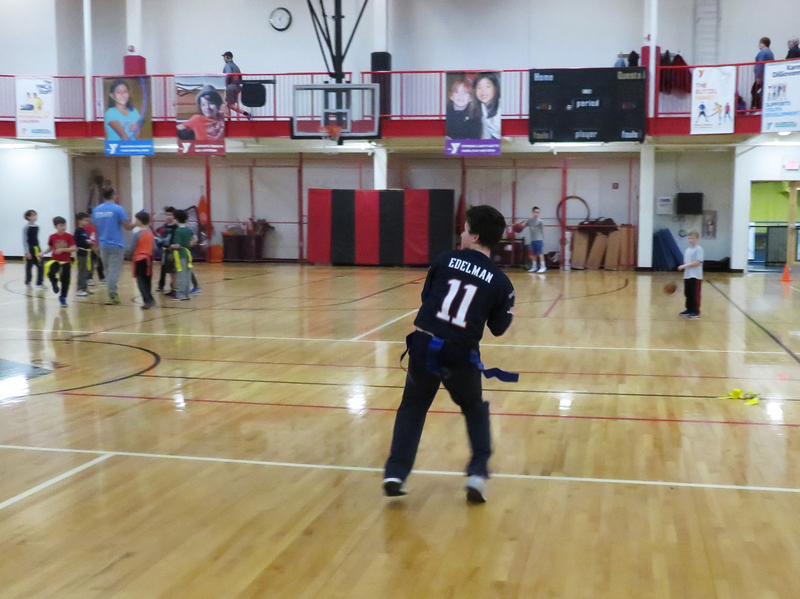 At the West Suburban YMCA, just outside Boston, the gaggle of little guys playing flag football, have no shortage of that "can do" attitude. "I like to copy off the Patriots, like how they stay at it and never give up," says 8-year-old Eric Weinberg. "It's my dream to follow in Tom Brady's footsteps and be famous for comebacks and win a lot," says 8-year-old Tommy Salem, who, when asked if he might be the next Tommy Brady, smiles and says, "Probably." Maya Schwartzberg, 11, who was at the YMCA to watch her brothers play, sayhe says she's also internalized that "can-do" spirit. "When I play football with my brothers, I keep on trying no matter what my brothers say about how they're so much better than I am," she says. "I just keep on trying no matter how low the chances." It's all a great lesson in determination and persistence. But the Pats' unprecedented winning record may also have created something of a monster ego, — and unrealistic expectations — in some kids. Many say they can't fathom a dream they'd deem too ambitious. Not even, say, flying. "I mean it'd be a little tough," says 12-year-old Owen Levine. "But you could learn. I mean practice, and I guess you could do it some day. There's nothing impossible as long as you try hard." "Like Julian Edelman said – 'just believe' and it'll probably come true," Salem says. Which puts some parents in a bit of a pickle. As one mom on the sideline put it: there is a fine line between encouraging big dreams and setting kids up to fail. "Not everyone is going to be Tom Brady," Amy DeThomaso says. "Sometimes you need a dose of reality." Twelve-year-old Sam Perron playing flag football at the "Y" says the lesson he's learned from watching the New England Patriots is to "never stop believing" and never give up. And when some kids take winning for granted, confidence can quickly turn to arrogance. DeThomaso says it's easy for kids like her son to overlook all the hard work that goes along with all that "believing." "He says I'm going to be a famous basketball player," DeThomaso says. "And [I said] 'so you have to practice,' and he said, 'No I don't, I know everything.'" That's the thing about confidence, it can just as soon sap your motivation, if you believe that superstars get that way from some innate talent, rather than hard work. "They're not gods. This is not magic, it's not a gift," says Stanford psychology professor Carol Dweck, who's spent years studying what drives achievement and what motivates kids. She sees the Patriots as something of a "poster team" for what she calls the "growth mindset," — the belief that abilities are earned, not inherited. And she says Edelman is spot on, when he says "You gotta believe." "We have shown that people go farther when they believe they can grow their abilities," she says. "There's no guarantee, but it does raise the odds." A life-long New York fan, Dweck chuckles, it's not easy to admit how much she admires the Patriots. "But as someone who studies mindsets," she says, "I have to." Though she's quick to add, there can also be a dark side to having outsized expectations. "Having people tell you that losing is not an option, could in some cases, – I'm not saying in this case – but could in some cases make people feel 'I have to win at all costs,'" she says. 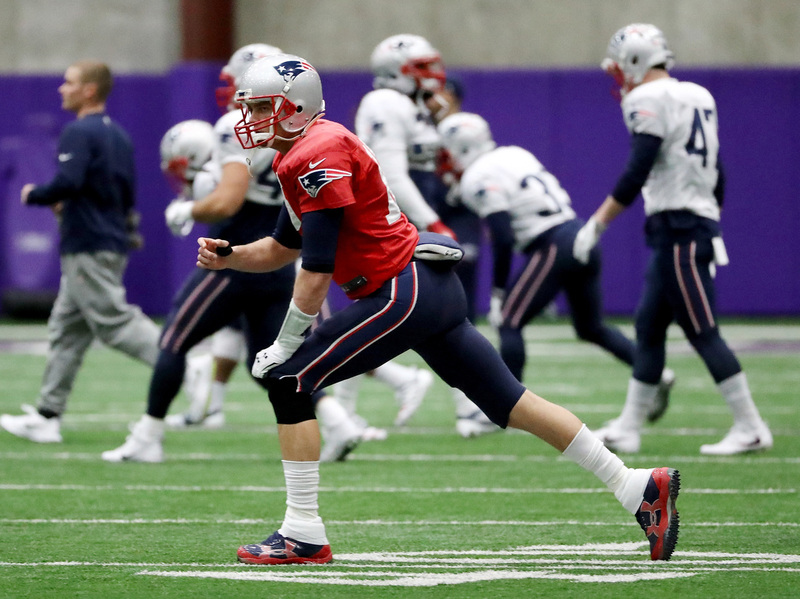 Patriots quarterback Tom Brady warms up during practice on Jan. 31, 2018, in Minnesota. The Patriots will play the Philadelphia Eagles in Super Bowl LII on Sunday. No doubt, the Pats are always looking for that extra edge. Whether Tom Brady's avocado ice cream, or the less wholesome allegations for which the Pats have apologized, or which they've dismissed as bogus jabs from jealous rivals. But that's also a lesson for kids. In many ways, Edelman says, it's harder to stay at the top, than to get there. "Because that's when...everyone is out for you when you're at the top," Edelman says. "And how you hold your self is a huge thing." The last eight years with the Patriots, has been like "getting my doctorate in leadership," Edelman says. "You constantly think about that, and it drives you. Y'know, I want to live up to the hype." Edelman will be watching the game in Minnesota, quite possibly shouting reminders to his teammates that "you gotta believe." As for the doubters and the "haters" – as they're called in Patriots nation – the team has their other mantras: "Ignore the noise" and "Do your job!" If things don't turn out the way they hope, kids like Owen Levine say they will know why. "Sometimes people might say they're giving 100 percent, but they're really only going 75 percent or something," he says. "But if you really are giving it your all anything is possible."